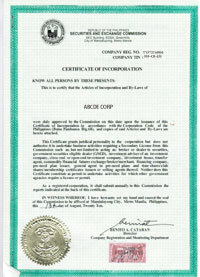 The cost for a business registering a corporation in the Philippines is based on the amount of authorized capital. Depending on the nature of the business and the percentage of foreign ownership there may be a minimum paid-in capital requirement. SEC fees for the registration of the articles of incorporation are calculated based on the amount of authorized capital. The minimum fees are based on an authorized capital of PHP 400,000.00. 1/5 of 1% of the authorized capital stock or the subscription price of the subscribed capital stock whichever is higher but not less than PHP 1,000.00 . PHP3,000.00 required for corporations which have more than 40% foreign ownership. A corporation with an authorized capital of PHP400,000 and more than 40% foreign ownership and one name reserved for 60 days.